‘DWTS’ Pros Challenge Charissa Thompson to Show Her Dance Moves! “Extra’s” Charissa Thompson “attempted” to learn some signature “Dancing with the Stars” moves from Val Chmerkovskiy, Artem Chigvintsev, Keo Motsepe, Sasha Farber and Alan Bersten. She may not be too skilled when it comes to classic dance moves, but she definitely knows how to split! Take a look! The guys are taking their professional dance skills on tour this summer, and will be joined by this season’s champ, Rumer Willis. To learn more about the “Dancing with the Stars Live!” tour and how to purchase tickets, visit DWTSTour.com. 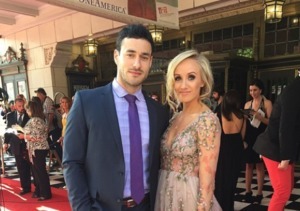 ‘DWTS’ Contestant Nastia Liukin Engaged!